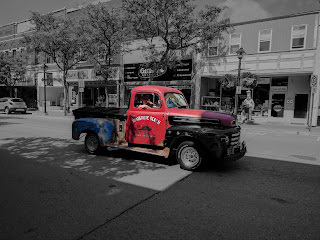 I really liked this old truck with the young couple in it driving down Main Street here in Orillia. I think it was part of the old car show going on in town, and I reckon it qualifies. I'm not sure what she means to have two fingers pointed horizontally but it looks like a sign of approval. It sort of reminds me of when I was young and had an old vehicle. It's about the only kind you can repair yourself these days because new ones are so complicated. Anyway I did a catch-up of photos that I took on the last leg of the Trent Severn Waterway and put them together into a video. I'm actually visiting relatives at the moment so will be away for a few days. Will be back on the boat and blog heading on the TSW this weekend.